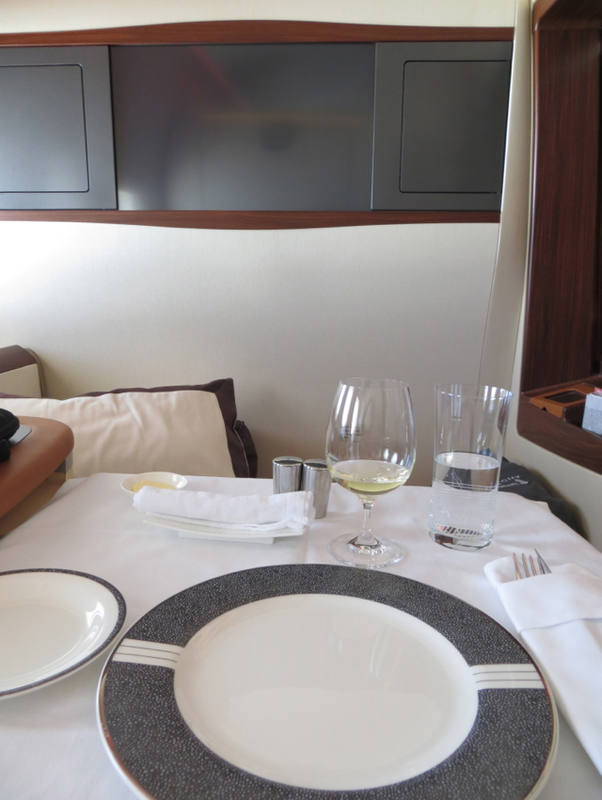 After freshening up in the Lufthansa Senator Lounge and checking email, it was time to board my 12 hour Singapore Suites flight from Frankfurt to Singapore. It was a new crew, but they knew exactly who I was, and welcomed me by name before showing me back to my window suite, 3A. 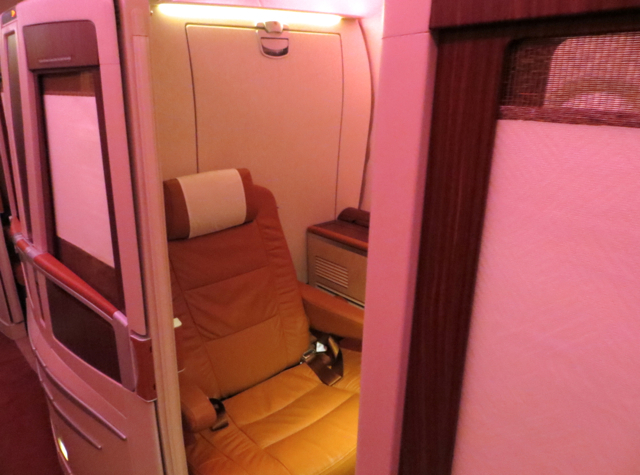 Two Singapore Airlines flight attendants as well as the flight's purser introduced themselves to me, and while this is typical not just on Singapore Airlines but in most of the best international first class cabins, I liked how genuinely friendly the welcomes seemed. I was again offered pajamas, although I declined as I'd kept those from my NYC to Frankfurt flight. The flight attendant offered that it could be for a family member if I'd like, which was nice, although since I try to travel lightly, with carry-ons only, I declined. I did accept a new pair of slippers and socks, however, as I hadn't kept those from the prior flight. Prior to take-off I was also offered a pre-flight drink (although figured readers didn't need another photo of my water) and the menu for the flight, which was actually part of the same menu booklet for the NYC flight, since NYC to Singapore via Frankfurt is still the same flight, albeit with a change of crews in Frankfurt. 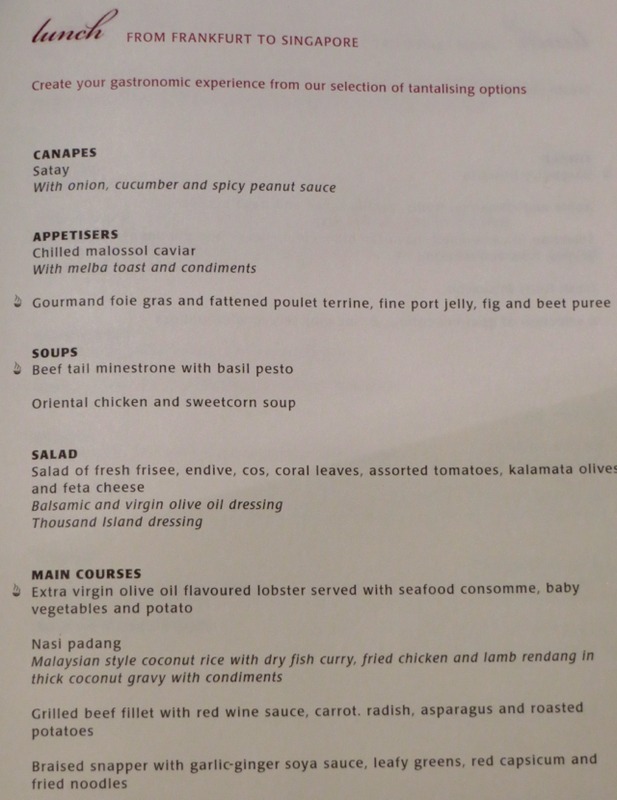 Here's the lunch menu, with a special menu by Georges Blanc, of the eponymous Restaurant Georges Blanc in Vonnas, about an hour north of Lyon (Georges Blanc creations have a symbol to the left of them) which included Malaysian style Nasi Padang, which was tempting enough that I asked if I could order it as an appetizer, given that I'd already pre-ordered a main dish via Singapore's Book the Cook service. 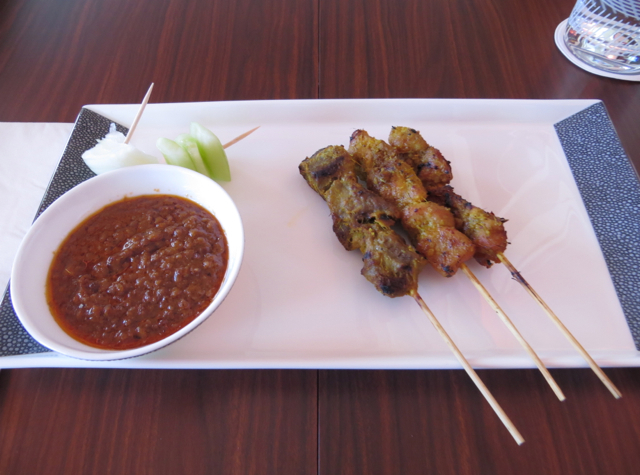 Even before our table was set for lunch, we were offered Singaporean lemongrass chicken satay. 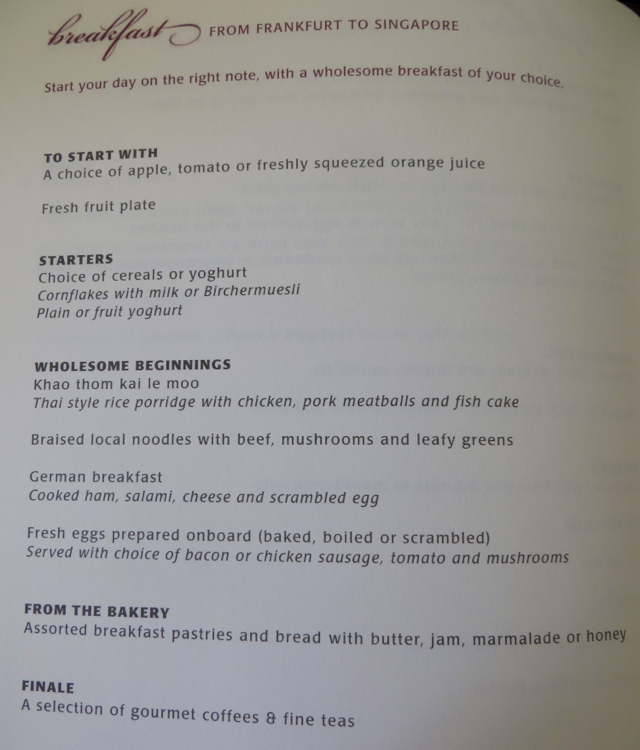 I remember enjoying this on my Singapore First Class flight from Moscow to Houston, and it was just as good as I'd remembered it. 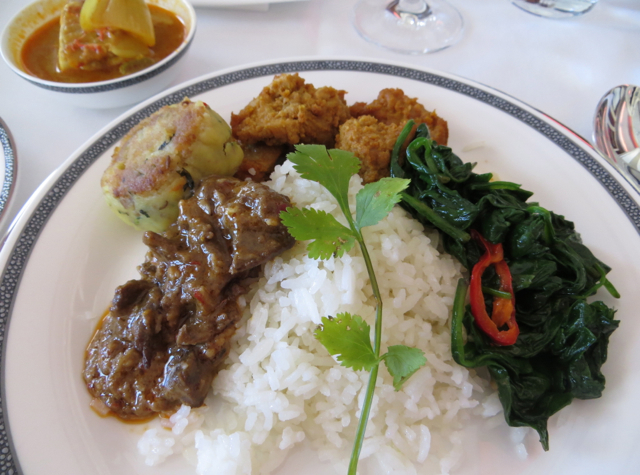 My table was then set for lunch, and I again chose the 2007 Piesporter Goldtropfchen Riesling Kabinett as a drink, since the sweetness was the best complement to the spicy dishes served as part of the Nasi Padang. Champagne, either Dom Perignon or Krug, would have worked well, but I've never cared much for champagne. I was pleasantly surprised by how good the Nasi Padang was, especially the lamb rendang. No, it's not of course as good as the best versions I've had in Malaysia or Singapore, but impressive given that it was prepared in Frankfurt. I'm sure it's different now in Germany, but the times years ago that I tried any kind of Asian food in Germany I always regretted it. The honey glazed duckling via Book the Cook, by comparison, was only ok. 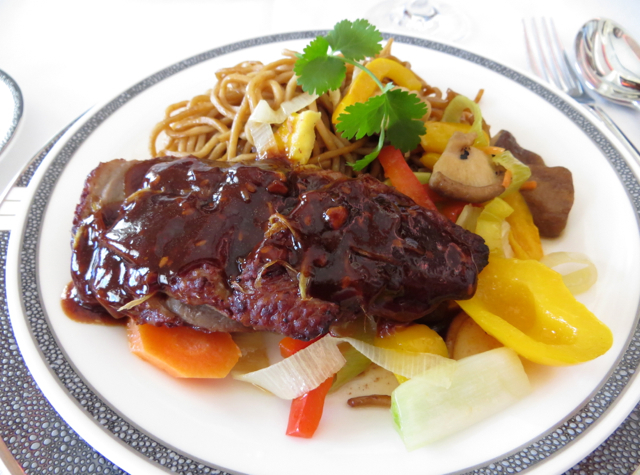 It didn't seem to be honey glazed at all, more like a hoisin type sauce, and the duck was somewhat overcooked. I was glad to have tasted the Nasi Padang, as it was the better dish, in my view. I chose the Raspberry Tiramisu from Georges Blanc. 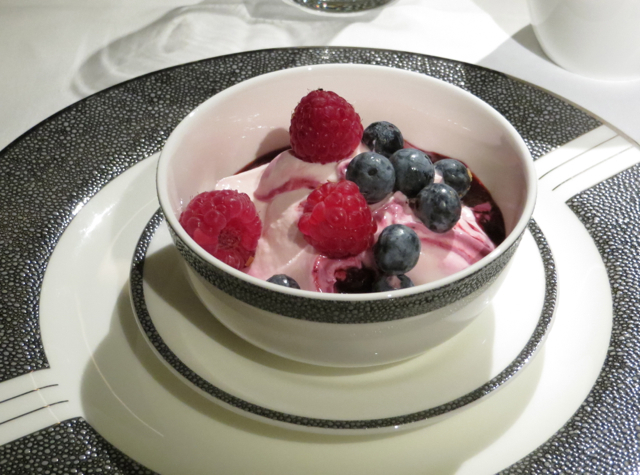 It was beautifully plated and presented, with perfectly ripe raspberries and a nice finale. 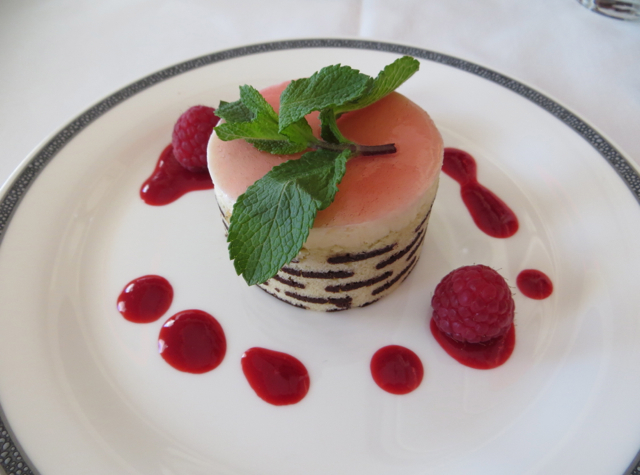 It ranks as one of the prettiest airline desserts I've had, although not the best taste-wise. Thanks to the longer flight time, the comfortable memory foam mattress pad and a sleep aid, I managed to get 7 solid hours of sleep. 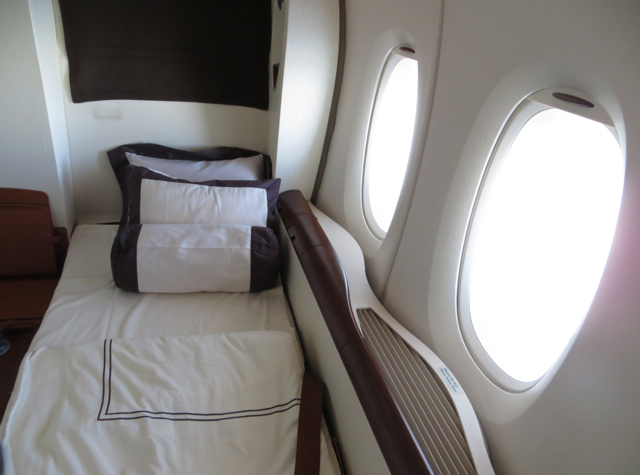 This is great for me on any flight, given that I'm a light sleeper, and I find that quality in-flight sleep really makes a difference on how quickly I avoid jet lag at my destination. I was glad that fruit yogurt was offered (it isn't on the NYC to Frankfurt flight) and it was some of the best I've enjoyed on a flight. I mentioned how much I enjoyed it to the flight attendant, and she smiled and said that it was Moevenpick yogurt and that she and the other flight attendants always tried to have some when going through Frankfurt. 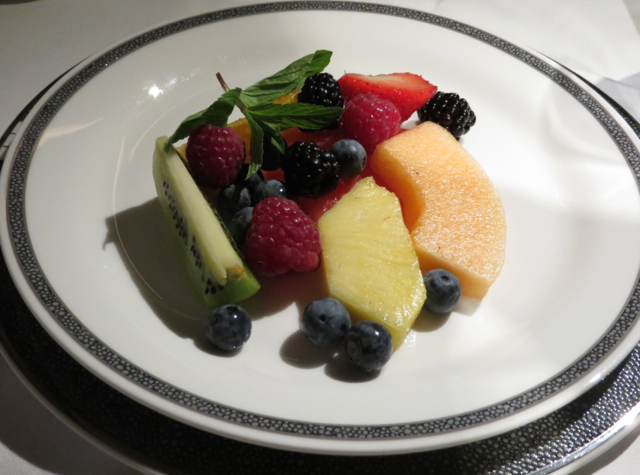 Note that the yogurt isn't actually served with berries, but I added some from my fruit plate. 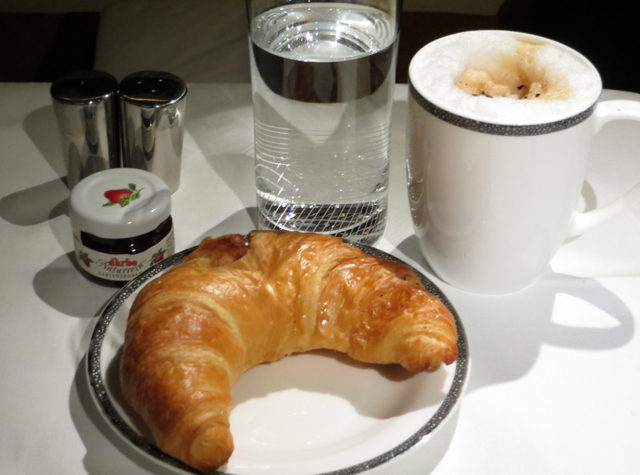 There was a basket of breads and pastries offered, and I tried a croissant. It was perfectly flaky and warm, much better than I expected on a flight, and I was also happy that jam was d'arbo, one of my favorite brands of jam. I also enjoyed a cappuccino, which featured plenty of foam and a dash of cocoa atop. 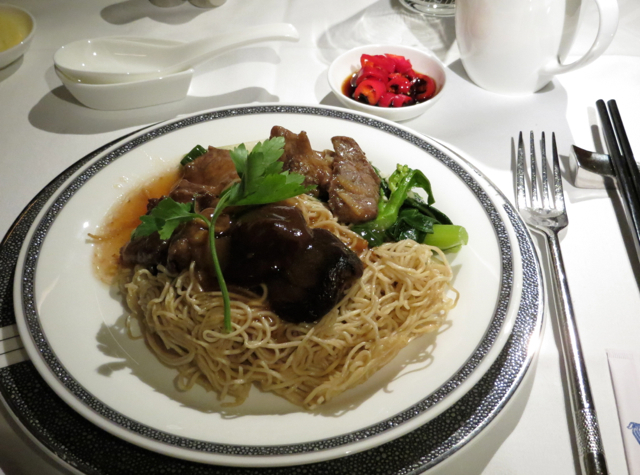 For a breakfast main dish, I chose the braised local noodles with beef, mushrooms and leafy greens, and was asked if I would like some fresh chilis with soy sauce as a condiment. Yes please! I think the crew picked up on the fact that I enjoy spicy food, not sure they would have offered this otherwise. Towards the end of the flight, I asked the friendly purser if I could take her picture, and she graciously obliged. 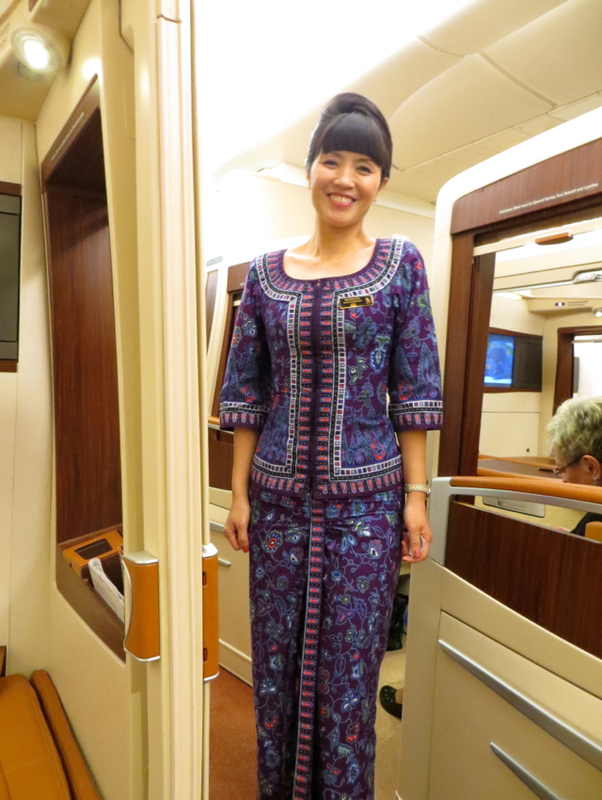 You can recognize the purser of a Singapore Airlines flight by the purple batik print she wears; leading flight attendants wear a green batik print, and regular flight attendants wear blue. I believe if the purser is a man the tie also features purple, but I'm sure one of my readers will correct me if it's a different color. Verdict: This was definitely my best Singapore Airlines flight to date, in large part thanks to the great sleep I got, friendly service from the crew, and a couple really delicious meal options–the Nasi Padang for lunch and for breakfast, the braised local noodles with fresh chilis, plus creamy Moevenpick yogurt. 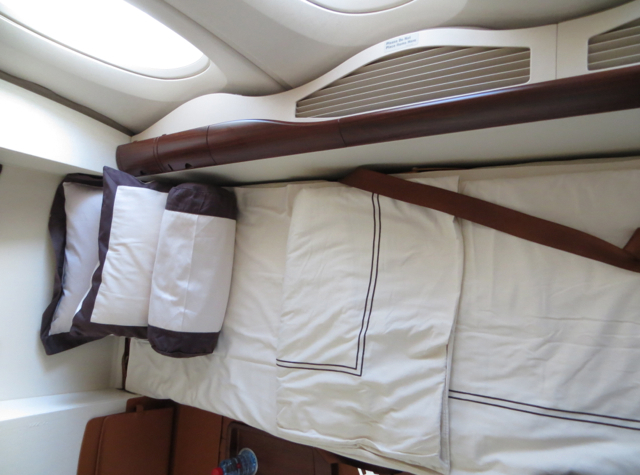 In my view, when a flight is 6 hours or more, you really want to be comfortable and ideally be able to sleep, and Singapore Suites delivers this, even for a light sleeper as I am. 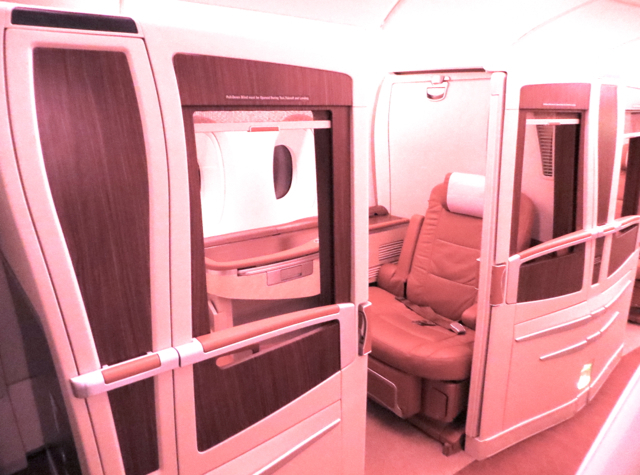 If you've flown Singapore Suites between Frankfurt and Singapore, what was your experience like?